Aurora (Sleeping Beauty) appears in both Magic Kingdom and Epcot - here's where you can see and meet her. Magic Kingdom - Princess Fairytale Hall: Disney periodically changes the princesses available at this location so you'll need to check to see if Aurora will be present during your visit. FASTPASS + is available for this experience. Included with park admission - no additional charge. PhotoPass photographers are on hand to take photos either with your camera or as part of the Memory Maker service. TIP: When present, Aurora takes time with each guest, the stand-by line can experience long waits so do this the first hour the park is open or later in the evening if you do not have a FASTPASS+ reservation. Magic Kingdom - Cinderella's Royal Table Princess Meals (breakfast, lunch, and dinner): Three or four princesses are always moving among the tables and Aurora is often included in the line-up. Other than Cinderella, Disney does not give advance announcements of which princesses will be appearing here on a particular day so do not promise your child that they will definitely dine with Aurora; just let them know that they will get to see some of the Disney princesses. Cinderella's Royal Table participates in the Disney Dining Plans - meals require two table-service credits per person. This location almost always fills so advance reservations are strongly recommended; full pre-payment is required at the time you book your reservation unless you have a package that includes a Disney Dining Plan. Epcot - Sleeping Beauty Meet-and-Greet in the France Pavilion: Have your photo taken with Aurora and get her autograph when she appears daily at various times in the France pavilion at Epcot. Get an Epcot Times Guide on the racks with park maps near the park entrance for exact times during your visit but a fairly typical schedule is for her to appear at 12:30, 1:30, 2:30, 4:20, 5:20 & 6:20pm for 30 - 40 minutes at a time. TIP: Because she takes time with each guest, lines move slowly. Arrive a few minutes prior to the scheduled meet-and-greet time and be ready to line up quickly to minimize waits. Cast members may cut off the line to new additions at some point in the session. Included with park admission - no extra charge. Epcot - Princess Storybook Dining at Akershus Royal Banquet Hall in the Norway Pavilion (breakfast, lunch, and dinner): Aurora often appears among the three of four princesses present at the princess meals in Epcot. The princesses are on a rotating schedule and there is no way to guarantee that Aurora will be present during your meal so avoid tears of disappointment by not promising your child that any specific princesses will be there. Advance reservations are strongly recommended. Disney's Grand Floridian Resort - My Disney Girl's Perfectly Princess Tea Party at the Garden View Tea Room This is a charming but very expensive experience for children. 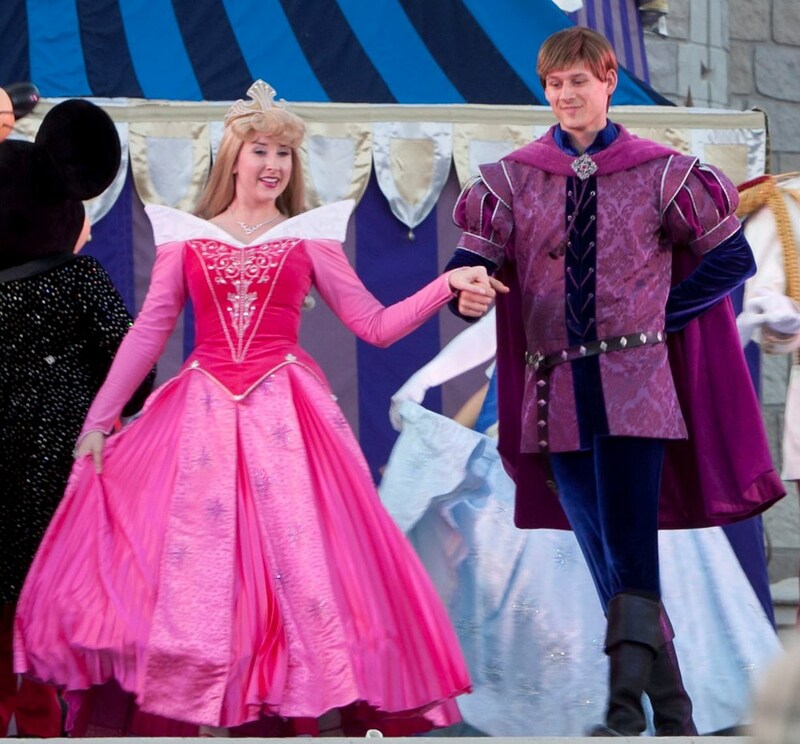 It includes singing, dining, storytelling, a little princess parade, and the opportunity to meet Aurora (Sleeping Beauty). Little girls receive a My Disney Girl doll dressed in an Aurora costume, a princess tiara and bracelet, a fresh rose, princess scrapbook set and a "Best Friend" certificate as keepsakes. Little boys receive a princely crown, plush Disney bear and a "Best Friend" certificate. Most little girls will come dressed like a princess for this experience. Prices start at $250 for one child accompanied by one adult; $165 per additional child, and $85 per additional adult. Advance reservations required - currently offered at 10:30AM on Sunday, Monday, Wednesday, Thursday and Friday. Maleficent, Prince Phillip and the Fairy Godmothers appear in the daily Festival of Fantasy Parade in the Magic Kingdom but Aurora is not present. Aurora's Ball Gown is on display at Castle Couture, a gift shop in the Fantasyland area of Magic Kingdom. Do you need a Fairy Godmother to help you plan your Disney Vacation? Let our Disney-focused travel agents work their magic on your vacation plans - we'll help with every step to make sure you have a wonderful and memorable experience and it won't cost any extra.